The E65 model electric actuator can be ordered as a fail pulling or pushing position under power loss: what sets this actuator apart is its spring assisted movement. The E65 offers the same power supply options as a standard electric actuator (115V, 230V, 24V) with superior fail position technology, pushing the spindle and plug down or pulling it up in the event of a power loss thanks to its spring assist. For instance, in the case of a 3-way valve, an actuator will fail in either the closed or open position. Depending upon its orientation and the available option to either pull or push while power can be accessed, the actuator will either close off the flow of AB to A ports or close the flow to the B port, thus opening the flow through AB to A ports bidirectionally. The innovative spring assist of the E65 adds security in the case of power loss; all other Baelz electric actuator models will fail in the last position during such an event. Baelz 373-E65-D-20 (pushing), designed to push the spindle down under power loss for models 342 and 347. The actuator will open AB to A, and it will close the B port. Baelz 373-E65-Z-20 (pulling), designed to pull the spindle up under power loss for models 342 and 347. The actuator will close AB to A, and it will open the B port. Outdoor Execution, equipped with a stainless-steel hood and thermostatic heater inside for high performance in extreme conditions. The outdoor-use E65 can support temperatures as low as -40 degrees Celsius, and its hood ensures protection for all electrical components. In addition to capacity for low temperatures, the outdoor model is also ideal for installation in high dust or pollutant-heavy areas, as well as harsh marine environments. The team at Baelz is committed to more than just providing our clients with industry-leading, reliable, high-quality actuators: we’re also committed to ensuring long product life spans and dependable, efficient performance. 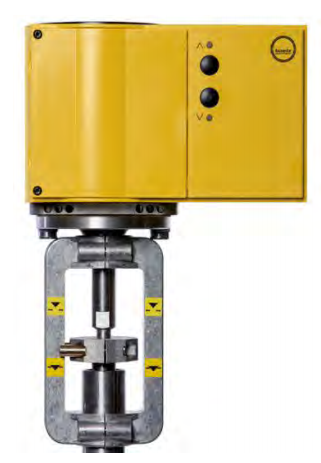 To coincide with the release of this actuator, we’ve created a new technical guide to provide all relevant product specifications and details; installation and safety instructions, product descriptions, transport and storage instructions, mounting directions, operating details, and wiring schematics. To access further information on our new actuator, download the E65 Technical Guide here. Baelz cost competitive equipment parts and services include (but are not limited to) controllers, control equipment, actuators, control valves, controllable ejectors, heat exchangers, automation skid packages, and engineered systems. Technical sales professionals are available to assist you with component selection/customization and service. Baelz North America specialist can assist you with selecting and ordering your component. To discuss options or learn more about our diverse capabilities, contact our team today.